Tyler Perry's Impressive Hollywood Rise Until it was flattened by the latest Ice Age movie, Madea's Family Reunion had the biggest opening weekend of the year. This was the second hit for writer, director and star Tyler Perry, who is transforming himself into an entertainment empire. 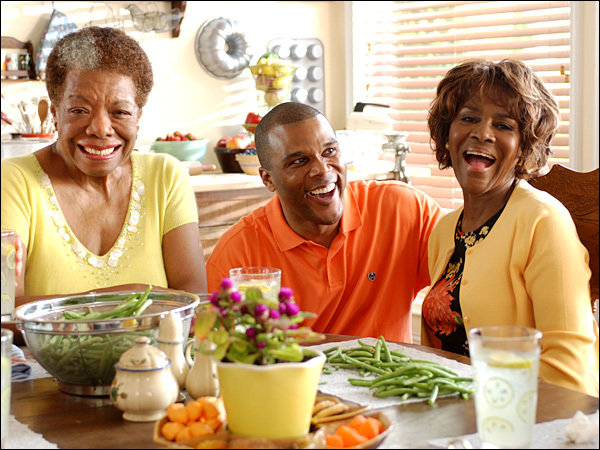 Perry appears on the Madea's Family Reunion set with co-stars Maya Angelou, left, and Cicely Tyson. 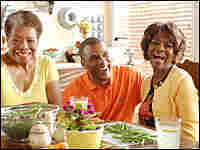 Until it was flattened by the latest Ice Age movie, Madea's Family Reunion had the biggest opening weekend of the year. This was the second hit for writer, director and star Tyler Perry, who is transforming himself into an entertainment empire. 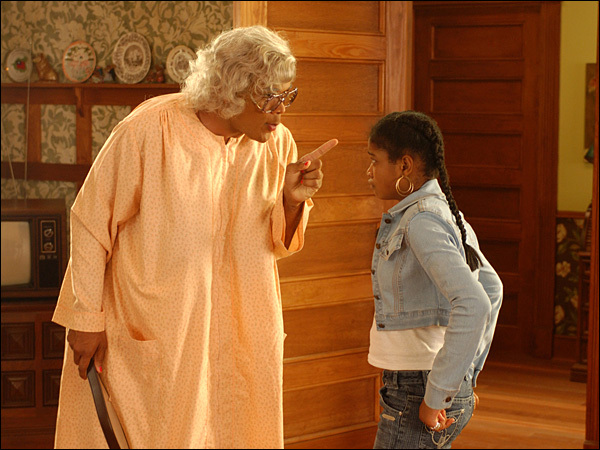 In her latest vehicle, Madea (Perry) becomes a reluctant foster mother to a girl (Keke Palmer). Like all of Perry's films and plays, Madea's Family Reunion includes gospel and old-fashioned virtue. But the star of the show is Mabel, also known as Madea, played by the towering Perry in a fat suit and a wig. Madea also appeared in last year's hit, Diary of a Mad Black Woman. And despite Perry's Christian themes, simple piety isn't always her strong suit. In the earlier stage version of Madea's Family Reunion, Madea is a smoker who packs a gun in her purse — one she uses to quiet the neighbor's barking dogs. Madea doesn't appear in Perry's next film, Daddy's Little Girl. And Perry, who played not only Madea but her brother and nephew in his first two films, won't appear on screen, either. Perry says he has other stories to tell and he isn't worried that fans will turn away if there's no Madea. His courage is hard-won. Perry suffered a three-month period of homelessness before his plays finally began to connect with audiences. But when they did, he built a formidable following. He made a fortune selling his plays on DVD through mom-and-pop stores and the Internet. After his first appearance in Los Angeles four years ago, Perry came away with a deal to make a sitcom pilot for CBS. But when creative control became an issue, Perry walked away, opting instead to write a film script based on one of his plays, Diary of a Mad Black Woman. Perry started working with Fox but once again walked away when the studio tried to impose its will. He ended up at one of Hollywood's few remaining independents, Lionsgate Films. Despite a critical drubbing, Diary of a Mad Black Woman stunned the industry. It grabbed the No. 1 spot on its opening weekend with a $22-million gross. A year later, Madea's Family Reunion managed the same feat with a $30-million opening. At this point, Perry is on fire. His new book, Don't Make a Black Woman Take Off Her Earrings: Madea's Uninhibited Commentaries on Love and Life, is a hit. No wonder he's confident about his next project: a novel attempt to launch a sitcom. Rather than trying to sell the idea to a network, Perry has already shot 10 episodes and is giving them free of charge to nine television stations in the hopes that the show will catch on. Perry acknowledges that he's tired. In mid-May, he'll make his last stage appearance for a while. He's been performing on the road almost nonstop since 1998. But Perry's idea of a break may not seem especially restful. He says he'll do some writing and work on his sitcom. And then there's his next movie, which starts shooting in June.